Does not matter whether it is your first time playing classical guitar or you have years of experience behind you, if you are looking for the best classical guitar strings out there and some of the criteria to judge them by, you are in the right place. Well, I guess it would probably be more useful for the beginners because I really hope if you have been playing for like 20 years you do know about the importance of tension. First of all, something that you have already figured out by now if you are on this page: not all strings are made equal. That is to say, obviously, strings made for acoustic guitars will not be any good for classical guitars because the material and construction of the strings will affect the sound of your guitar and you probably should not be using steel strings because they might damage your guitar or change the sound. Low – low tension strings are easier to play with so they are great for beginners but they do not have the same volume or projection as high tension strings. Medium – sort of the best from the two worlds. High – logically, high tension strings are a bit harder to play with but they produce amazing volume and projection. If you are a beginner, I would say, like with any other string instruments, go for something simple, in this case low tension strings or medium tension. Low tension will make your practices easy while medium tension strings will be a great in between the low and high tension strings. Get experience playing with low tension string sets and then move on to higher tension strings if that is what you want. The material is the next big thing to consider. Like with a loft of other guitar types, material affects tone and the feel of the instrument, making it vital in decision making. You will get different materials for treble strings and bass strings. Treble strings usually made of either clear nylon or rectified nylon. Both create mellow and smooth sound but the choice will depend on your preference. As for the bass, they are usually 80/20 bronze or silver-plated copper. Bronze strings create bright sound with great projection while silver-plated copper creates warmer tones. And do not forget, look for good coating on your strings to protect them and prolong their lives. Strings might be cheaper than a lot of accessories but you do not want to be throwing out one after another because they break every week. On market for over 40 years, D’Addario has been uncompromisingly innovating and creating affordable accessories for music lovers all over the world. Fortunately for you, strings are one of the accessories they have been mastering for years. In fact, the company actually ventured into the string business by creating classical guitar strings first. 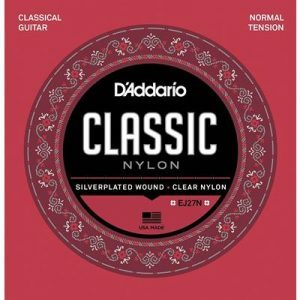 So if you are getting D’Addario strings for your classical guitar you can be sure that years of experience and trial and error have gone into making them. 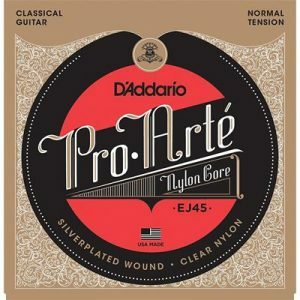 D’Addario EJ45 Pro-Arte Nylon Classical Guitar Strings are one of their most popular and affordable models. Made with precision by being laser measured for diameter and tension levels, this model has industry standard medium tension and silver plated copper winding on the multi-filament core to create basses and integrate projection and warmth in string set. I would say this is a perfect string set for beginners and experienced players as well. It is very affordable and will not give you as much projection and volume as something that costs three times as much but it is definitely a great standard with really nice tone and life. I have always associated Ernie Ball with good quality and affordability. This model is just another proof strengthening my trust for the company. 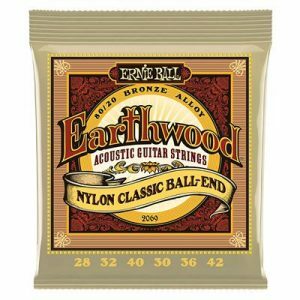 Ernie Ball Earthwood Folk Nylon Ball End Set is 80% copper, 20% zinc wire wrapped around nylon core creating smooth and rich classic tone. Although designed for classical guitars I have heard of people using it on acoustic guitars with great success. These are medium tension strings, making them a great in-between of high tension strings which sound great but are hard to play with and low tension strings which are great for beginners but do not produce as much volume. Because of the materials used in this set, the sound is much warmer but at the same time this makes it less articulate. So if you are playing something fast, this strings might not be the best option. But with the slower playing, this model produces a great sound. Ernie Ball has always been able to make products that integrate quality and cost without disappointing clients and this model is not an exception. If you have been through any of our other string guides or any other websites you might have noticed D’Addario products once or twice… or maybe ten times. That is not because D’Addario marketing team is ravaging to find more people to talk about them and pay thousands and thousands of dollars. No, my friend. Most websites talk about them so much because D’Addario actually has some of the best strings out there and their selection definitely does not lack in variety. This set of strings is great for beginners (yeah maybe word “student” in the name of the model might have given it away), but any professional would love to use it. With 3 clear nylon trebles and 3 silver-plated copper basses, this medium tension set creates a great balance between warm tone and projection as well as the price and quality. If you are a student barely scraping through college fees or a parent who wants to get strings for their kid’s new classical guitar you have definitely found the right one. Medium tension makes is a great compromise between low and high tension strings so you will not be missing out on either of them. Being in business for over 250 with as much popularity and availability as Savarez is not a simple coincidence. The only way to be this consistent in production and success the company has to be equally as consistent with quality and affordability of their products. And Savarez is doing just that. They offer products at a range of prices from low enough for beginners to high-end for professionals. That being said, they never compromise their quality no matter how affordable the product. 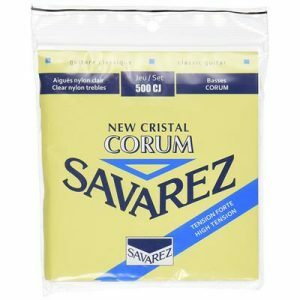 You are lucky if you are looking for classical guitar strings Savarez 500CJ Corum Cristal Classical Guitar Strings is one of those high-quality “traditional” guitar strings that are popular among professionals but they come at a cost of any other affordable strings out there. Savarez has always been big on classical strings, they have the most experience in them and that is exactly why some of their strings are that high esteemed. One thing to consider is that this set is high tension so if you are a beginner beware of that. Although if you are looking for something more medium to light tension they have those options as well. 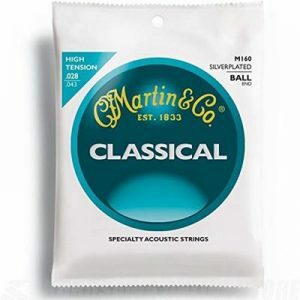 If you just got your first classical guitar and need a new set of strings because the ones on the guitar just simply do not cut, Martin M160 Silverplated Ball End Classical Guitar String set is a great beginning. I am not going to say that they are better than highest quality strings that you can find on the market but for that price (basically half price of the regular strings) you are getting a very nice quality set of strings. They are not just easy to play with but because of its ball end construction they are easy to tie, this will be extremely useful for anyone who just does not want to bother themselves with tying or has no idea how to do it. Affordability, good quality, easy to use – what else can you really ask of from a good set of strings? Classical guitar is one of my favorite instruments, they are very popular and great for beginners. No matter whether you have been practicing for a year or two, just got your first guitar, or are a professional, you can never underestimate the importance of strings. 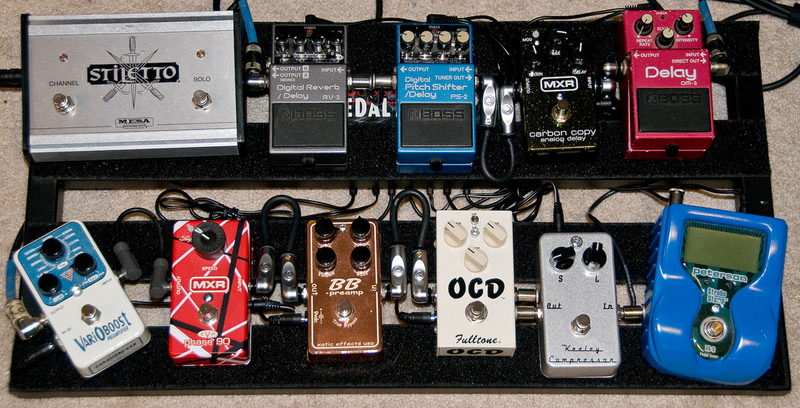 A good set of strings can have a drastic effect on the tone and feel of the instrument. If you do not do your research you might end up with an awful set that ruins the sound of your treasured guitar but if you investigate a little bit more and take your time you might get a set that makes an even crappy guitar sound good. As mentioned, tension and material are two of the most important aspects to consider when trying to find the best classical guitar strings you can (not saying that there are not a lot of other factors, but these two are a priority). Just like with any other instrument or accessories I cannot give you a clear-cut answer, the only thing I can do is give you general guidelines and several suggestions but you can only find the right one by practicing and experimenting with different strings.